For a long time, I've been wondering if I'm the only person who's bothered by the fact that there is a device that is sold legally whose sole purpose is to help people evade the law. I'm talking about those radar detectors for your car that let you know when police are nearby so you can slow down to the legal speed limit, and then speed up again after you're away from the cops. I'm not a goody-goody. I've certainly gone over the legal speed limit in my driving career. A couple of years ago, I foolishly got a speeding ticket at a very well-known "speed trap" near my house where the limit is 35, and it seems there's no reason to go under 50. But that's the law. When I got the ticket, I didn't run out and buy a radar detector/scrambler to help prevent me from getting another ticket. I kicked myself for being so dumb. It's not like this radar thing is a device whose aim is to make a noise whenever you're driving too fast to remind you to slow down. We already have that device — it's called "the spouse." No, this thing's purpose is to help people break the law, and it's sold and purchased without any outrage. I don't get it. If there were electronic devices sold to bad guys to let them know when the police are close enough to catch them robbing a liquor store, I guarantee people would not be so blasé about them. I'm not a stickler for people obeying every single law. I don't care if you rip off that tag from your mattress. I'm not upset that you deducted that dinner you had with your old fraternity brothers as a business expense. I don't even care if you marry your first cousin. (Just don't ask me to explain it to your parents.) But this is about speeding, and speeding kills a lot of people. Yet we don't seem to take it that seriously. One reason is because almost everybody speeds. 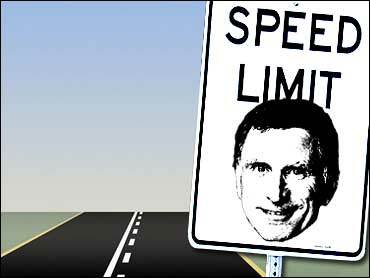 Official estimates are that 90 percent of drivers sometimes go over the speed limit. Very often, the posted speed limit just seems absurdly low to us, and since "everybody else" is speeding, why shouldn't we? Most people feel that they are the greatest drivers in the world. The thinking is, "Maybe those stupid drivers need to go that slowly, but I can handle a car at a much faster speed." And maybe you can. Maybe you really are the greatest driver in the world. But if you're speeding, it's much harder to avoid one of those stupid drivers — or pedestrians or animals — than if you're going slower. If you end up in an accident, it's going to be a much more serious accident if you were speeding than if you were going slower. For those of you who understand math, "the forces experienced by the human body in a collision increase exponentially as the speed increases. The crash varies with the square of the impact speed." For those of us who don't understand math, what that means is, "slow down." Being in a hurry is part of our culture today, but it doesn't always make that much sense in a car. Road rage is one of the few rages that I don't have. What's the difference if I get wherever I'm going a few minutes later? It's very rare that I have to drive as fast as possible because it's a life or death situation in which I must deliver an emergency quip. And I'll bet you find yourself in just as few urgent situations in your car. Obviously, the people who buy these devices don't think that owning one increases their risk of getting into an accident. And I assume that the people who sell them don't think they are possibly contributing to serious accidents and even deaths. But that is the reality, even if it's unintentional. If you disagree with me and think I'm way off base on this, let me know. But you don't have to tell me right away. And whatever you do, don't feel you have to e-mail me using your laptop or Blackberry while you're speeding in your car on the way home. I can wait until you get there. What's the rush? Lloyd Garver has written for many television shows, ranging from "Sesame Street" to "Family Ties" to "Frasier." He has also read speed-read a few books, when no one was watching.